When you wind a clock, you are storing energy in it. This occurs either in the tightly coiled mainspring or in the raised weight. A series of gears inside the clock transmits that energy to the last and smallest gear: the escape wheel. The escape wheel cannot move unless it is allowed to do so by the action of the 'pallets.' The pallets resemble a see-saw. They rock backward and forward, and each time they do, they allow one tooth of the escape wheel to pass. The sound of the escape wheel teeth striking the two faces of the pallet accounts for the 'tic - toc' sound that clocks make. 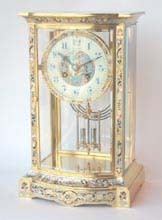 The speed at which all this occurs is governed by either a hairspring (in watches and small clocks) or by a pendulum. In general, the longer the hairspring or the pendulum, the slower a clock or watch will run. Therefore, if your pendulum clock is running slow, you need to shorten the pendulum a bit to make it run faster. Theoretically, the clock will run until the mainspring winds down so much that the force of the escape wheel weakens, or in weight-driven clocks until the weight has fallen as far as it can go and has no more energy to give. Basically, then, clocks run by slowly releasing energy that we have stored in them. That is, until friction rears its ugly head!